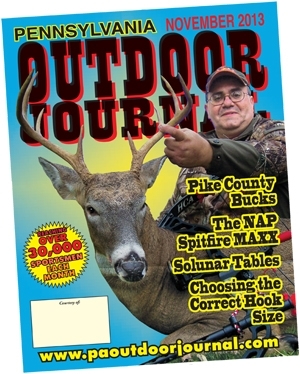 PENNSYLVANIA OUTDOOR JOURNAL is an outdoor magazine covering the state of Pennsylvania. Published 10 times a year, our pages offer articles on fishing, hunting and trapping – how to nail flushing birds, find the trophy buck, call in the boss gobbler, and locate the biggest brook trout. The Sportsman’s Photo Gallery and other pages highlight the trophy catches of you and your neighbors – archery bucks, buster brown trout and monstrous catfish. If it is legal to hunt, fish or trap in Pennsylvania — big game, small game, game fish, panfish, rough fish, shooting, muzzleloading, archery, furbearers, fly fishing, trolling, bait fishing — then you’ll most likely find it in our magazine. Each issue has current solunar tables and advertisements for a wide range of sportsman-assisting products and services. PENNSYLVANIA OUTDOOR JOURNAL is owned by sportsmen that have always lived in Pennsylvania and who wish to serve their fellow sportsmen.